Klong’s Book Stopper is a beautiful minimalistic object that consists of simple geometric shapes. You may freely choose which side will remain visible when supporting your favourite novels, the square or the round one. 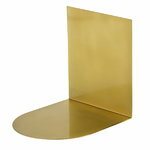 The lovely bookend, designed by Mats Broberg and Johan Ridderstråle, is available in brass and copper.